We Have Two New Armizare Free Scholars! The Guild’s newest Free Scholars: Nicole Allen and Jacques Marcotte. Neither rain, nor sleet, nor snow (lots and lots and lots of snow) could stop this past weekend’s Free Scholar Prize Play! Nicole Allen and Jacques Marcotte are two long-time Guild members. Nicole joined the CSG only a few months after its founding in January 1999, played her Armizare Scholar’s Prize in 2001 and is part of the first group of students to become double scholars (Armizare and Renaissance Swordplay). Jacques joined several years later, and has been an assistant instructor for many years, teaching the Saturday morning Taste of the Knightly Arts class since time immemorial (or 2009). Consequently, they are vibrant, integral parts of the CSG family, and this made their at testing for Free Scholar all the more a cause of celebration. By Guild custom, students must spend at least three years at the Scholar rank before progressing to Free Scholar, although in practice it has taken twice that time or longer. In part, this is because, prior to opening of Forteza Fitness, and with it, the implementation of multiple training days, it was impossible for students to get in enough training time “on the mat”. 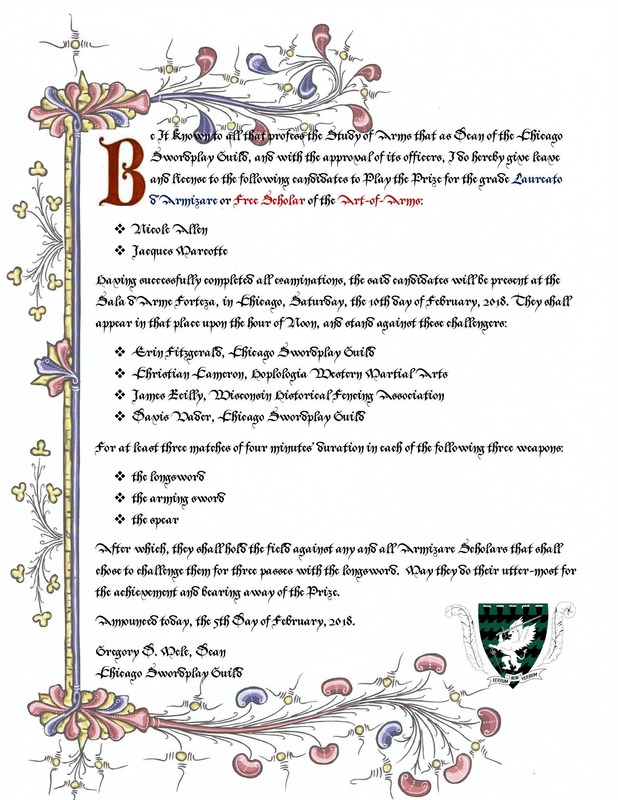 Additionally, the Scholar curriculum is extensive, comprised of the entirety of Fiore dei Liberi’s dagger curriculum for use out of armour, longsword at wide play, elements of longsword and close play, arming sword and spear. Each of these components has its own written, skills and sparring exams, and students must pass all of them, a number of reading assignments, and complete a scholar project before being allowed to take their comprehensive written and skills exams. THE PRIZE, or, NOW WE FIGHT! Three, four-minute rounds with each of three weapons: longsword, arming sword and spear. The Ordeal, in which the prizor holds the field against all Guild Scholars who wish to challenge them to three blows with the sword. At the CSG we have always invited one or more outside challengers to help test the prizors’ skill at arms. This past weekend, we were joined by Mr James Reilly, chief instructor of the Wisconsin Historical Fencing Association’s Kenosha branch, and Mr. Christian Cameron of Hoplologia in Toronto, Ontario. Joining CSG Free Scholars Davis Vader and Erin Fitzgerald, together they provided the timed rounds of the Prize. Swearing the Free Scholar’s Oath after receiving the Gold Garter, the grade’s symbol of rank. 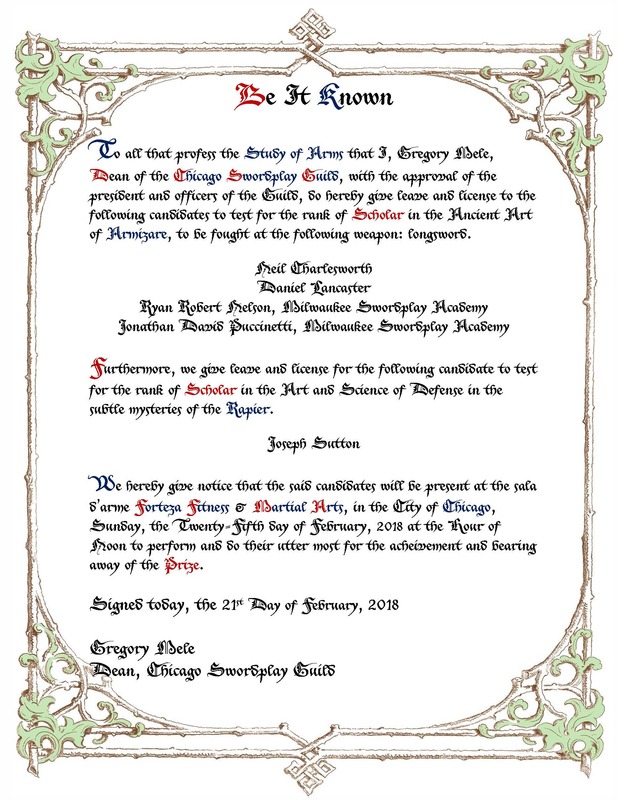 Ceremony and ritual was a large part of medieval and Renaissance life, and although our Guild is a modern one, we seek to connect to the spirit of those who have gone before through both the Prize and the ceremony by which our Scholars, Free Scholars and Provost are invested in their rank. 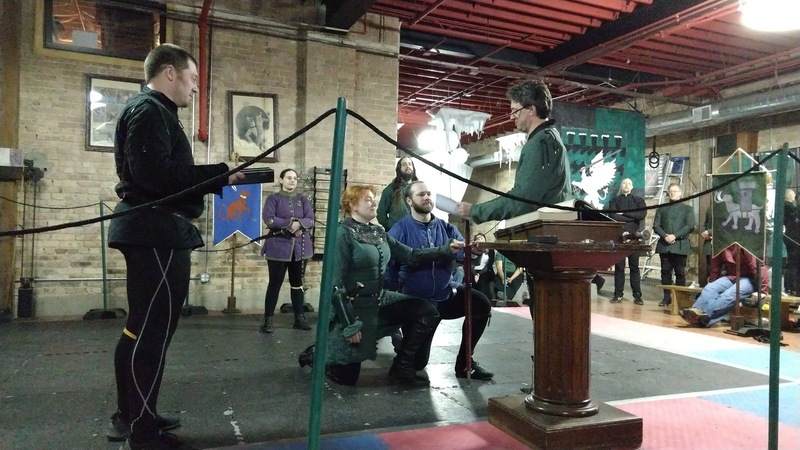 The investiture ceremony involves a lesson on the symbolism of Fiore’s four animals, a charge with new responsibilities and duties, the bestowing of gold garters, and finally, a swearing of the Free Scholar’s Oath, adapted for modern use from those of the old London Company of Maisters. Much of the modern world has lost the sense of ritual and its purpose: to initiate. At its heart, the Prize is an ordeal: both in preparing for the exams, and then facing your peers (or those whom you wished to be acknowledged as a peer) and your fears in front of friends and loved ones. It’s an ordeal that also brings student and teacher, prizor and challenger, together in a unique bond that is revealed to be both ordeal and celebration; a symbolic reflection of how we travel the road to mastery of both the art and ourselves alone, yet succeed through the presence and support of our community. 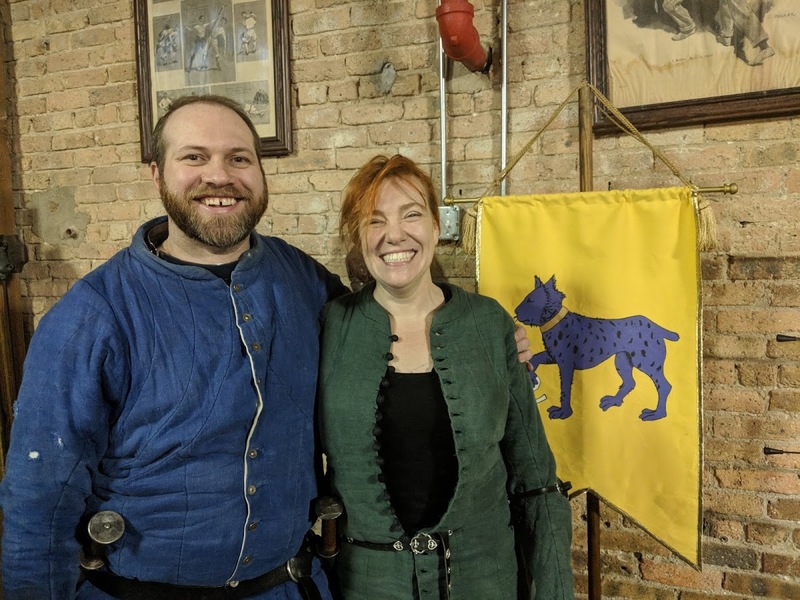 Speaking of that community we are all extremely proud of Jacques and Nicole both for the hard work training, testing and fighting, but also for the long years of service and support they have shown their Guild family, marrying the chivalric virtue of prowess with that of largesse. A hearty and heart-felt congratulations to them both! We are pleased to announce there will be a playing of the prize for the grade of Laureato d’Armizare (Free Scholar of the Art of Arms) and Rettore d’Armizare (Provost), this upcoming Saturday (February 10, 2018), at the Sala d’Arme Forteza, in Chicago. 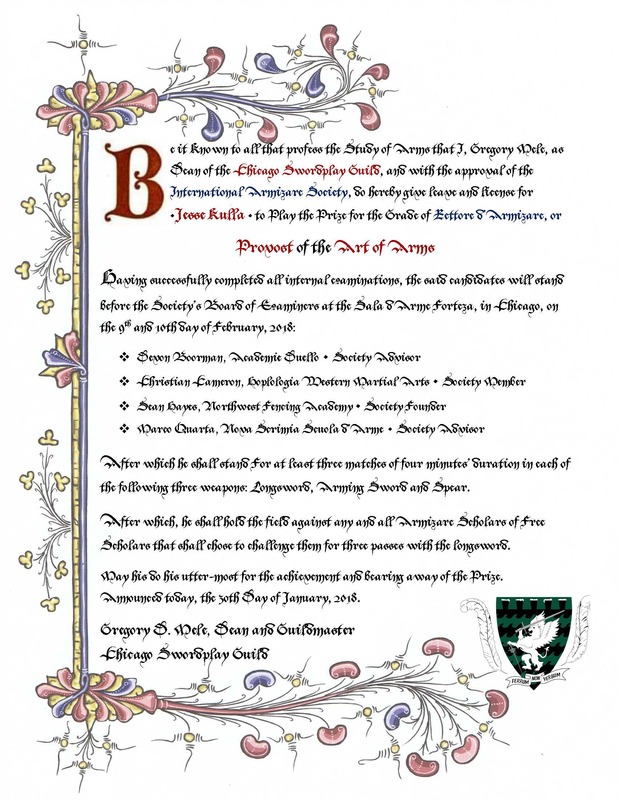 In addition, the day marks our third Armizare Free Scholar Prize since the Guild’s inception, the candidates are long-time Guilders. Nicole Allen of Revival Clothing and Historica fame, has been with the Guild since shortly after its founding in 1999, and Jacques Marcotte has been one of our Taster Class instructors for nearly a decade. Please join us in wishing Jesse, Nicole and Jacques the best of luck in the upcoming ordeal!